All UTSA students should vote no on the Proposed Athletic Fee increase. This proposal raises athletics fees by 25 to 50 percent immediately and 37.5 to 65 percent for students who take 15 to 18 credit hours over the next two years. The Athletic Department at UTSA is carelessly handling our money, hiding associated costs within the department and will dramatically raise costs for the UTSA student body. UTSA athletics currently operates 12 sports teams. 11 of them are losing money because we disregard the additional bail out that UTSA provides the programs. During the fiscal year that ended August 31, 2016, here is what the following teams lost: Men’s Basketball: $758,997.44; Women’s Basketball: $1,058,694.60; Baseball: $858,322.95; Men’s Golf: $285,100.13; Women’s Golf: $351,345.35; Women’s Soccer: $615,231.58; Softball: $615,199.58; Men’s Tennis: $365,018.65; Women’s Tennis: $372,392.64; Volleyball: $728,563.93; and Track: $1,553,043.95. The UTSA football team requires further examination. A quick look at the Audit Report seems to show a profit of $1,244,431.22, but that is not accurate. Under “Direct Institutional Support,”—money UTSA takes from your fees and redirects “as needed,” henceforth referred to as “bailout money”—the football team received $1,496,462.00. So, if you take into account that UTSA subsidized the football team with your money, in addition to the Athletics fee, the football team lost $252,030.78. When you add up the losses for only the teams in the UTSA program, and disregard the 1.5 million dollar bailout to the football team, UTSA athletic teams lost a combined $7,813,941.29 according to the fiscal report. This is while the team’s revenues, when disregarding bailouts from UTSA, total revenue from the teams totaled $10,138,607.21, the non-program specific expenses (athletic director’s salary, all the admin staff, buildings, etc) total to $8,481,404.21. So while the teams do make around 10 million dollars a year in ticket sales, media rights and donations, the athletics teams also incur costs of around 17.5 million dollars while the athletics department incurs expenses of around 8.5 million dollars. This demonstrates that the athletic program is not effectively managing the $12,159,733 from athletics fees and the $3,093,707 in “bailout” money. These large losses will hurt students. The following shows how much we are effectively being charged per semester credit hour (SCH). If we divide the revenue from the athletics fee by the athletic fee rate, we can determine a rough figure for the number of semester hours taken at UTSA during fiscal year 2016 (FY2016). $12,159,733.00/$20/SCH = 607,986.65 SCH. We can then determine the additional cost per SCH incurred when UTSA gives additional money to the athletics program: Direct Support/Total SCH. $3,093,707/607986.65 = $5.09 per SCH. This means that effectively you are currently paying over $25 per SCH for the athletics program. 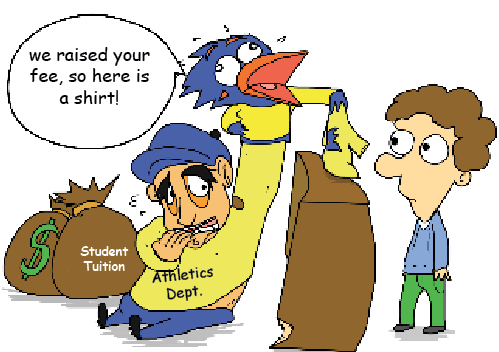 The athletic fee cost to us is currently controlled by the $240 cap per semester. Due to the cap currently in place, no student is charged more than $240 a semester in athletic fees no matter the amount of SCH they are enrolled in, but a vote in favor of the athletic fee raise will remove the cap. The removal of the cap greatly increases the fee per year. To determine the fee we currently SCH x Athletic Fee Rate = Charge, to not exceed $240. Without the cap in place, a 15 SCH student would be assessed $300 a semester, a 25 percent increase over the current fee system. A 18 SCH student would be assessed $360 a semester, a 50 percent increase over the current rate. If we include the $2 increase over the next two years, a 15 SCH student and an 18 SCH student will be assessed a 37.5 percent and a 65 percent higher fee respectively. The Athletics Department has not demonstrated enough fiscal responsibility to justify raising the student athletic fee. Athletic Director Lisa Campos has inherited a program that has clearly been fiscally irresponsible in the past.